Description: Our smallest thermistor with a 0.9 mm diameter sensor heat and 32 gauge wire. 50K ohms at 25 °C, for measuring from 0 °C to +150 °C. 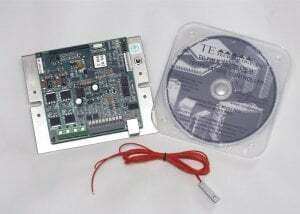 For use with TC-36-25 series and TC-720 series controllers. Thermistor can be mounted in a hole or on a surface. The wire leads can be extended with standard copper wire of any gauge recommended for the controller (no special alloy necessary). This sensor has a small 0.9mm diameter, 6.35 mm long cylindrical head. The resistance is 50K ohms at @ 25 °C (TS-104/ 50K curve). 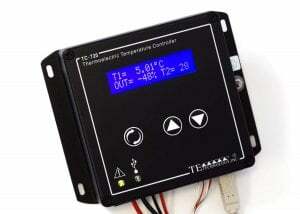 This temperature sensor has a measurement range of 0 °C to +150 °C and works with our TC-36-25 RS-232 and TC-36-25 RS485 as well as the TC-720 and TC-720 OEM temperature controllers. 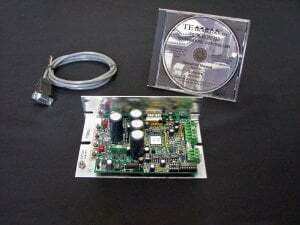 This thermistor can be mounted in a hole or against a surface. Wire is 32 gauge solid, overall length is 152 mm. The wires have a thin varnish insulation (similar to magnet wire) and are not terminated. Although delicate, these thin wires have an advantage in that they do not conduct much heat into the measurement head of the sensor, and they are easy to preheat or precool. This helps ensure accurate temperature measurements. 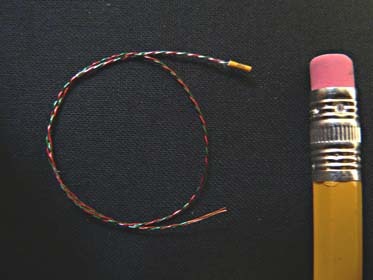 Typically, a larger diameter wire is added to this thermistor to as an extension to increase the overall distance from controller to measurement point. The wire leads can be extended with standard copper wire of any gauge recommended for the controllers (no special alloy necessary).